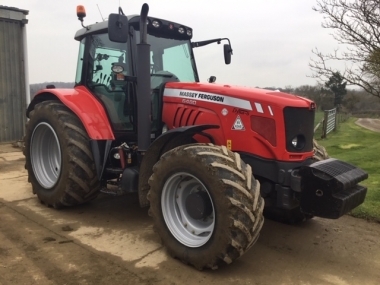 Massey Ferguson 8700 series includes the MF8727 - 270hp, MF8730 - 300hp, MF8732 - 320hp, MF8735 - 350hp and range topping MF8737 - 370hp. All models are fitted with the well proven industry leading constantly variable transmission, Dyna-VT. With 205 litres/min Closed Centre Load sensed electric control spool hydraulics, integrated front linkage, pneumatic 3 point cab suspension and super comfort front suspension. The MF8700 series is equipped to tackle the toughest of jobs. 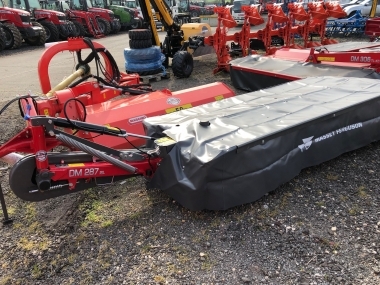 Massey Ferguson range topping 8700 series includes 5 models from the MF8727 at 270hp to the MF8337 at 370hp. With Dyna-VT constantly variable transmission, 50kph, Pneumatic 3 point cab suspension, Front axle suspension and 205 litres/min CCLS electic spools, full steering guidance options and weight from 10,800kg unballested up to a fully ballasted working weight of 18,000kg the MF8700 series tractors are a truly versatile workhorse for all the heavy draft cultivation and drilling on farm. With 8.4 litres displacement from its six cylinders, plus third generation Selective Catalytic Reduction (SCR) technology, Exhaust Gas Recirculation (EGR) and a Diesel Oxidation Catalyst (DOC), the engine used in the 8700 series is not only one of the most productive powerplants available, but is also among the most fuel efficient on the market. Engine Power Management (EPM) now provides a 30hp power boost for PTO work and transport (above 20km/hr). Improved heating using a combination of electric and engine coolant provides an efficient heating system. Large fuel (630l) and AdBlue (60l) tanks allow you to work for longer without refuelling. Dyna-VT and DTM ensure maximum efficiency whilst reducing fuel consumption. The spacious ‘Panorama’ cab features a purposeful layout, with superb instrumentation, intuitive Dyna-VT controls and levers and switches grouped on the armrest to the right of the operator. Four pillars allow for unrestricted visibility and a wide door and adjustable cab steps provide excellent access. An extremely comfortable seat and 4-point suspension system ensure the cab is always at an even level. Optional OptiRide Plus allows control of the level of damping via the in-cab dial. The Datatonic 4-Control Centre Display (CCD) has a 7-inch colour monitor mounted on the armrest which is fully adjustable for optimum viewing of the tractor’s functions. 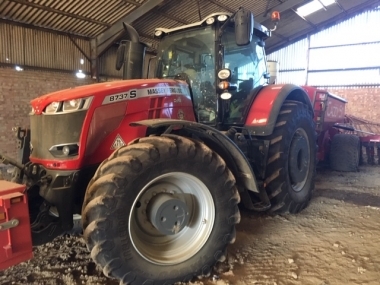 The instrument panel is clear and concise, displaying main tractor warning functions for total control of your machine. Efficient is the entry specification package for the MF 8700 series but you will notice that it is anything but basic. 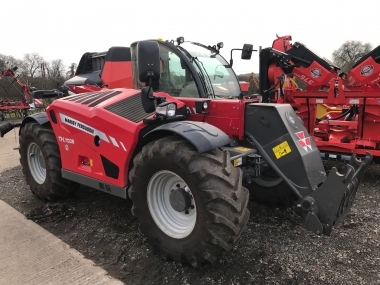 Dedicated to delivering increased productivity thanks to key features, the Efficient specification will enable the operator to work really fast, to a higher standard, with more accuracy together with high levels of comfort, ergonomics and reliability. It provides all the key elements with a blend of simplicity and ease of use, with all key functions ergonomically grouped in the Control Command Centre armrest. You’ll always find the usual necessities within our cabs but we always strive to push operator comfort and control to the next level. That’s why the Exclusive package comes with dramatic new features that will help to improve further your working day. 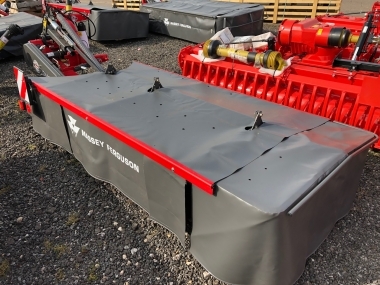 The Exclusive MF 8700 Package is dedicated to the more intense, large scale operator looking for more advanced features that will ensure cost effective benefits for their business. Optional front PTO is available across the MF 8700 series. The combination of robust front linkage and PTO options strengthens productivity and flexibility. Nominal PTO speeds are achieved at, or near to, 2000 rev/min (max. engine power). The excellent power delivery ensures that there is a perfect match of the PTO speed and forward speed close to maximum at all times. For lighter duty work, ‘540 Eco’ or ‘1000 Eco’ PTO speed is achieved at around 1600 engine revs, improving fuel economy and reducing in-cab noise. In ‘Auto’ mode, PTO is automatically disengaged when linkage is raised (or when travelling above 25 km/h) and re-engaged when linkage is lowered. 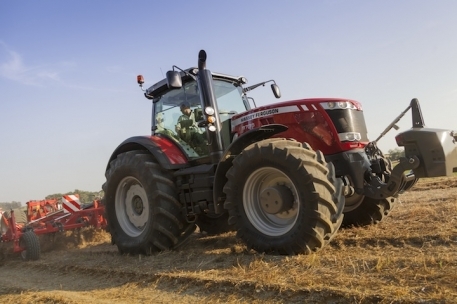 Transmission Controller monitors and controls PTO engagement depending on load. QuadLink suspended front axle is fitted as standard, providing excellent ground clearance and good turning angles. SpeedSteer and Auto-Guide satellite navigation are optional. Electronic Linkage Control (ELC) system gives the highest standards of draft control with accurate depth settings and ground contour following. The result is more weight transfer and better traction, less wheel slip, reduced tyre wear and fuel consumption and greater output. Closed Centre Load-Sensing (CCLS) hydraulic system provides 175 l/min oil flow for linkage and external services. 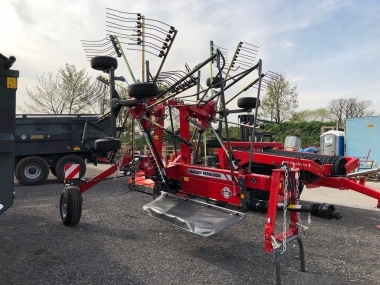 Shock absorbing Active Transport Control (ATC) is integrated into the ELC system to minimise the ‘pitching’ action, automatically adjusting for different implement weights. ATC operates with QuadLink for exceptional stability when transporting or operating mounted equipment at speed. Rear linkage lift capacity is an immense 12,000kg. 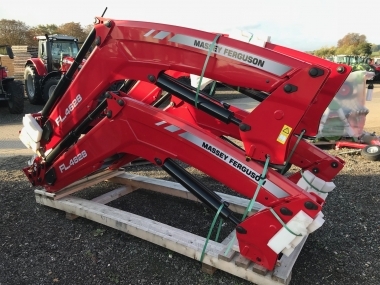 Two front hydraulic couplers provide hydraulic service for implements, with an overall lift capacity of just over 5,000 kg. buy every original 8700 - Range part online.